Divine Oil more than lives up to its saintly title. An elixir of life for dry, flaky skin, dull, lacklustre locks and spirits in need of uplifting, this golden oil restores both body and soul to a state of well-being. Perfect for a mood-enhancing morning bath, or relaxing massage at the end of the working week, the subtle scent of Moroccan and Bulgarian roses, pink grapefruit and spicy pink pepper, helps banish the blues and leave your skin feeling velvety soft and cared for. 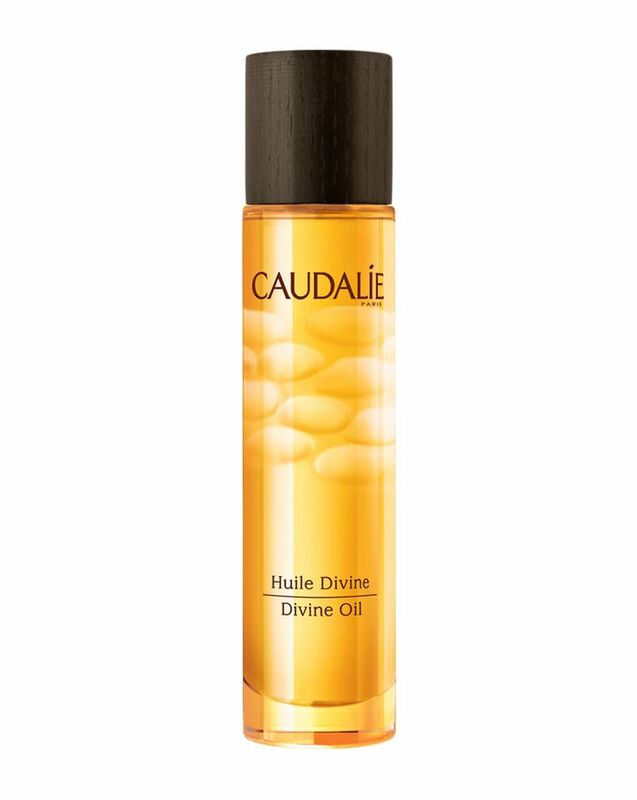 A heavenly multi-purpose product, Caudalie's Divine Oil is the perfect antidote to the cardinal beauty sins. From split ends to cracked cuticles, dry elbows to frayed nerves, this beautifully scented oil soothes hair, skin and senses with its intensely nourishing properties and heavenly floral fragrance. With a blend of grape, hibiscus, sesame and argan oils, together with Caudalie's patented antioxidant polyphenols it floods skin with moisture, to instantly transform it from parched to perfect. Massage into areas of dry skin or hair, pour a few drops into bath water or dot onto pulse points as a soothing, floral perfume. Use wherever and whenever needed to feed skin, hair, nails and senses. Grape Oil: Rejuvenates and nourishes. Extra Virgin Argan Oil: Restores hydrolipidic film. Sesame Oil: Softens and moisturises. Patented Antioxidant Grape Seed Polyphenols Vitis Vinifera (Grape) Seed Oil, Sesamum Indicum (Sesame) Seed Oil, Isoamyl Cocoate, Coco-Caprylate, Fragrance, Ethylhexyl Palmitate, Butyrospermum Parkii (Shea) Butter Extract, Helianthus Annuus (Sunflower) Seed Oil, Hibiscus Sabdariffa Seed Oil, Argania Spinosa Kernel Oil, Ethylhexyl Methoxycinnamate (Octinoxate), Butyl Methoxydibenzoylmethane (Avobenzone), Tocopherol, Ethylhexyl Salicylate (Octisalate), Palmitoyl Grape Seed Extract, Solanum Lycopersicum (Tomato) Fruit/Leaf/Stem Extract, Citric Acid, Hydroxycitronellal, Benzyl Salicylate, Geraniol, Butylphenyl Methylpropional, Linalool, Citronellol, Limonene, Alpha-Isomethyl Ionone. Do yourself a favour and buy this! One-stop solution for head to toe dryness problems. Plus it smells like heaven. I got this today I was so excited to try this on, as I have a dry skin in the face also body this oil gives that dewy look for me and the smell last long, I love it. I actually bought the product because Huda Kattan highly recommended it. The packaging is great, also the way it dispenses too, but unfortunately the smell is way to overpowering. I therefore really don't like to use it as often as I would normally use such a body oil. I will not repurchase. Lovely oil but very strong smell. This oil is amazing. I use it every day and works a treat. It smells gorgeous and it sinks in without a sticky or oily residue. One of the main plus points is the spray dispenser, it goes exactly where you need it and you don't have to work about getting the product everywhere. Definite repurchase. Love the oil, it is dry after used and smells so good. Nice on hair, not sticky at all. Works amazing on my dry sensitive skin, just like all Caudalie products. This oil is great for dry, patchy and damaged skin. I love the hydrated feel my skin is left with after use. The bottle is also really pure looking, the right packaging for an oil like this. This oil is a winner in my book. Not a big fan of the smell, though. This is a little to heavy for my taste - i like my skin products to smell a bit, but I would have preferred the smell to be more subtle - so be aware if heavy smell is a dealbreaker for you. This oil smells lovely and quite light. I like the texture - it's not too sticky on the skin but moisturising enough and give your skin a lovely glow.